The BBQ is not only for making﻿ chorizo, morcilla and panceta, but also a cooking tool ideal to nail any other dish, no matter how difficult or soffisticated it seems to be. Thanks to the range of BBQ accessories available on the market, now it’s possible to grill your fish nicely without ruining it or making a mess with its skin. We are really talking about ‘besugueras’, a special fish-shape-rack (as seen in the picture). To cook fish, just put it on the rack and place it on the barbecue. Take into account that no flaming embers should be underneath the fish, or you will burn it. You must use indirect heating, which means removing all the flaming embers aside. The prawns will be fine with some flame on them and don’t need a special fish rack. The result will be the same as if you grill them in a pan, but with a priceless plus of charcoal aroma. The black olive powder is made by placing the olive, in a tray, on top of a baking paper. If possible, cover the BBQ so it cooks them evenly like in the oven. The heat will dehydrate the olives up to completely dry them. Once cool, smash them to get the powder. If you want to offer your guests an original ‘sea & land’ dish, sign up for this idea. Pork and seafood always pair pretty well. Clean the scallops, remove the coral, grill quite slightly its meat on the grill and set it aside. Cut the black pudding into medium size slices and grill them on the BBQ. Once done, place them in each scallop shell and then add a scallop. Put the sauce on top of all. For the sauce, you will need to cook the milk cream in a small pot on the barbecue, add the watercress and blend. If you want to keep the nice green color to the watercress, scald and place it into cold water with ice before cooking it in the milk cream. 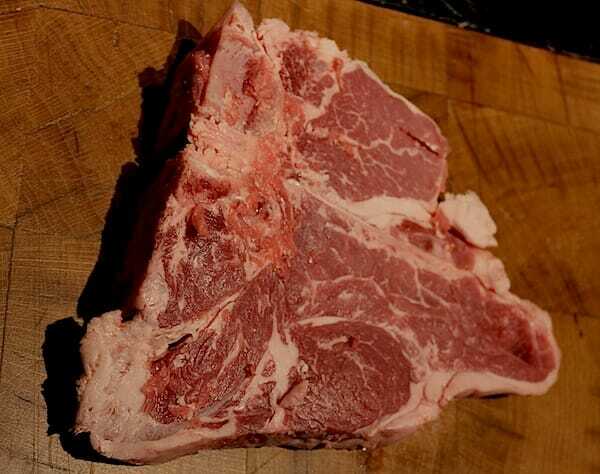 When it comes to flavor and texture, T-bone is not only one of the most amazing beef cuts, but also quite unknown in Spain. It sums in the same piece all the ‘entrecotte’ flavor and the incomparable tenderness of the sirloin. And grilled, it becomes a delicious delicatessen. Our recommendation is, firstly seal it directly with embers on both sides, so it keeps juicy inside, and then finish it with mild heat until it’s done to taste. The ‘piquillo’ red peppers don’t need too much work: slightly cooked on both sides on a tray on the BBQ, they’ll concentrate all their flavor scented with an intense charcoal aroma. The gorgonzola sauce is easy to make. Sauteé minced onion & garlic in a pot, add the cheese, stir it until it mixes and then pour a little milk. Some sauteéd pine nuts can be added, too. Small dry vine shoots give the touch of flavor that will surprise everyone and won’t be forgotten in a long time as well. Way cheaper than hake ones and with a fantastic result, they only have to be pretty cleaned by removing the membrane on their front side. Place them in a special holed rack that doesn’t allow them to move (WEBER brand). This tray gives them the charcoal-like and nice Golden color. Any reduced lemon flavored sauce matches perfectly. 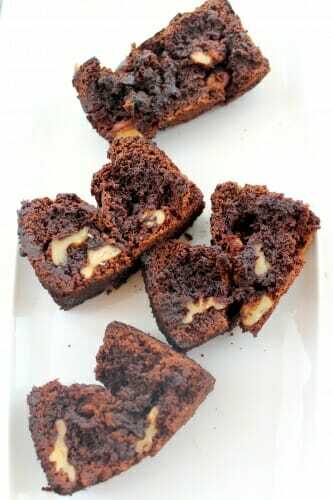 As we claimed on many occasions, the barbecue is also great for making desserts, and one of the best results given comes from the classic American Brownie. Melt 250 gr of coating chocolate*, 85 gr of butter, 260 gr of sugar, a pinch of vanilla extract and a pinch of salt. Meanwhile, sift 60 gr of flour and 5 gr of baking powder and set aside. Add 2 eggs to the first mixture, one by one. Don’t add the second one until the first one is well beaten and mixed. Then add the second mixture and mix both carefully. Use a rubber spatula to ‘fold’ gently from the sides to the center. Don’t forget to move the bowl to get all the sides folded over the center. When done, add 50 gr of walnuts. Grease and lightly sprinkle cocoa powder a non-stick baking pan. Place it in a covered BBQ with no embers underneath the pan, which must be between 180-200°C. * Set the chocolate in a metal bowl. Boil water in a pot. Put the bowl on top of the pan while stirring until it melts completely. To make sure the bottom doesn’t burn, place a brick or a plant pot and put the baking pan on it. In the barbecue everything takes longer to be done. The brownie will take around 1h 30 min to be ready. Melt some sugar in a pan on the BBQ. When it gets a nice golden brown (not burnt), add hot cream milk with the vanilla and a pinch of salt. Watch out!!! The cream milk will rise quickly once it boils. Reduce the topping for 5-10 min. Let it settle on the fridge until it cools and gets thick. Once cool, we can lighten it with some more cream milk. Tick the box under these lines before sending your comment. We use this system to prevent automatic comments used for advertising.